FORT WORTH, Texas (November 7, 2018) – Kevin Harvick’s dominant win in Sunday’s AAA Texas 500 will remain a victory in the Texas Motor Speedway record books. That win, however, no longer locks him into the Championship 4 as the No. 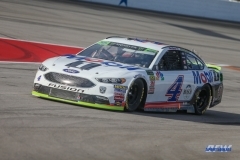 4 Stewart-Haas Racing Ford team was issued a severe L1-level penalty Wednesday morning, an infraction that changes the entire complexion of the Monster Energy NASCAR Cup Series Playoffs. Harvick was stripped of the automatic championship berth that comes with a victory in the Round of 8 and given a 40-point penalty for an issue related to the rear spoiler according to Section 20.4.12 of the NASCAR Rule Book. The infraction was found at the NASCAR Research & Development Center in Concord, N.C., during post-race car and engine teardown. Harvick falls to fourth in the standings, just three points ahead of teammate Kurt Busch for the final playoff spot, as the NASCAR Playoffs head to ISM Raceway in Avondale, Ariz., for Sunday’s Round of 8 elimination race that will determine which four drivers will compete for the series championship on Nov. 18 at Homestead-Miami Speedway. The precarious situation is heightened by the fact that Harvick will be without his crew chief Rodney Childers and car chief Robert Smith, who have both been suspended for the final two races of the season as part of the penalty. The No. 4 team does have the right to appeal the penalty to the NASCAR Motorsports Appeals Panel, but Greg Zipadelli, vice president of competition at Stewart-Haas Racing said the team will not appeal. In addition to the points penalty to Harvick, the SHR team was docked 40 owner points. L1-level penalties also were handed down to AAA Texas 500 runner-up Ryan Blaney and fourth-place finisher Erik Jones, who were both penalized for body panel infractions. Blaney, the driver of the No. 12 Team Penske Ford, was found with unapproved door front crush panels while Jones, the driver of the No. 20 Joe Gibbs Racing Toyota, had issues with the car’s body and package tray. Neither Blaney nor Jones is among the remaining eight contenders in the NASCAR Playoffs.